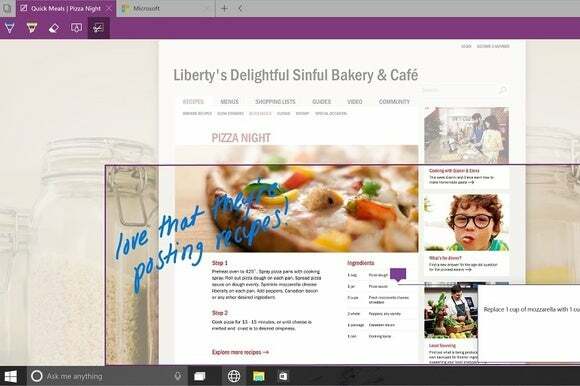 Called Project Spartan during a demonstration at Wednesday’s Windows 10 event, the new browser was shown running on a PC, although it will also be available for mobile devices. The name is an important point, because it may signal that IE 12, as we know and perhaps not love it, may continue to appear in Windows 10 as a separate, alternate browser. The principal feature Microsoft was ready to demonstrate Wednesday was the ability for users to mark up Web pages and share the markups with other users in a variety of ways. The markups can be made with digital pens on touch-screen devices that support their use, or more traditionally with a keyboard. This way, the new Spartan browser—final name forthcoming—can be empowered as a kind of collaboration device. Based on its growing knowledge of each user, Cortana will also get activated in more nuanced scenarios. For example, Cortana will automatically find the flight information of a close relative when the user goes to the website of an airline, and provide ingredients information based on users’ dietary restrictions and preferences when a restaurant site is visited, according to Belfiore. Overall, the demonstration shows that Microsoft is capable of producing a new rendering engine, based on its Trident engine used in Internet Explorer currently, but embedded in a new browser console that omits much of the baggage and “console” functionality typically associated with IE. For instance, we didn’t see bookmarks or history or search, just the Web page in a tab with a URL. Microsoft also demonstrated built-in support for PDF format pages without the need for an Adobe Reader plug-in. The very latest builds of the Spartan browser may not ship with the next builds of Windows 10 for developers, although it should be easy for testers to utilize the revised Action Center—also demonstrated today—to upgrade their browser components without installing an entirely new operating system. Today’s demos omit any indication of the relative performance of Spartan’s rendering engine versus the latest Trident engine used in IE11. Arguably, the new renderer does need to demonstrate performance improvements if it is to enable true HTML5 functionality in the way Web developers envisioned.